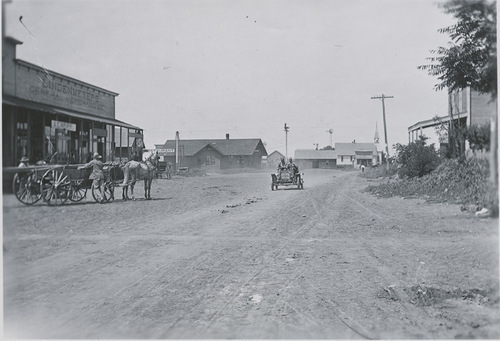 View of two men in an open automobile, competing in a Glidden auto tour, on a street in Dorrance, Russell County, Kansas. The Glidden auto tours were timed, long distance road rallies organized from 1902-1913 throughout the United States by the American Automobile Association (AAA) as a means of encouraging automotive travel and the development of safe roads. Also visible in the photograph are two men standing near a horse-drawn wagon loaded with lumber in front of Lindenmeyers General Merchandise store, a second wagon, utility poles and power lines, windmills, a church steeple, and the buildings and businesses along the city street.